This is a list of individual combat equipment issued by the United States Marine Corps. This list does not include items that are issued as uniforms or weapons and ordnance. Many items on this list have nicknames. See list of United States Marine Corps acronyms and expressions. The Scalable Plate Carrier was developed for troops in Afghanistan due to concerns of excessive weight limiting mobility, especially in mountainous terrain. The Outer Tactical Vest (OTV) is being replaced by the MTV for most forward units. The Personnel Armor System for Ground Troops (PASGT) vest remains in some limited use in training and non-deployable units. The Full Spectrum Battle Equipment kit includes a quick-release ballistic vest, integrated breathing and flotation devices, as well as load bearing equipment. The Combat Integrated Releasable Armor System (CIRAS) has replaced the FSBE AAV for some units. The Enhanced Combat Helmet is a new helmet made of high-strength polyethylene with superior ballistic protection compared to previous Kevlar helmets. The ECH is being issued only to deployed units and will be turned in upon return and given to other combat units. Previous helmets like the LWH are being retained for training and noncombat use. The Lightweight Helmet (LWH) can be used with the older sling suspension or a newer pad suspension to fit the helmet to the head, as well as a nape protection system to add ballistic protection to the rear of the head. The MICH TC-2000 Combat Helmet is issued to some specialized units. The Personnel Armor System for Ground Troops (PASGT) helmet has mostly been replaced by the LWH, but can still be found in some units. The Enhanced Combat Vehicle Crewman’s Helmet (ECVCH) allows the crew of M1 Abrams, AAV, and LAV vehicles to communicate with less restriction on mobility and situational awareness without reducing ballistic protection. Most pilots and aircrew will wear a flight helmet for protection from aviation-related hazards (such as an integrated oxygen mask), but typically offers little ballistic protection. The Pith helmet is worn not for ballistic protection, but to identify weapons range coaches and other range personnel. 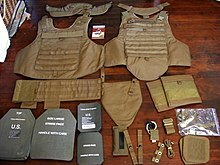 Small Arms Protective Inserts (SAPI) are used with the MTV and OTV to provide protection beyond what the vest itself offers. SAPI are also available in side plates to protect the torso. The Advanced Bomb Suit is a type of bombsuit used by Explosive Ordnance Disposal. 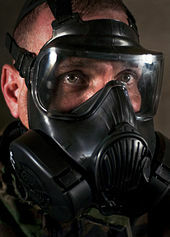 The M40 Field Protective Mask is the standard gas mask, but is being replaced by the M50 Joint Service General Purpose Mask. Mission Oriented Protective Posture (MOPP) is a NBC suit with overalls, a hooded jacket, gloves, and overboots to protect against direct contact with contaminents. 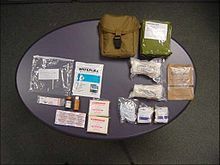 The Mk I Nerve Agent Antidote Kit (NAAK) consists of a pair of autoinjectors containing atropine sulfate and pralidoxime chloride for first aid against nerve agents, and are due to be replaced by the single ATNAA. The Family of Improved Load Bearing Equipment (FILBE) is the latest load bearing equipment to be issued to Marines. It replaced the old ILBE due to incompatibility with body armour systems. FILBE is made in coyote, has a modular system and allows its users assemble the configuration to its need. The Improved Load Bearing Equipment (ILBE) is the load bearing equipment and pack which was issues during 2004–2012 years. It replaced the MOLLE, was the first to be made in MARPAT (MARine PATtern), and greatly increases durability, comfort, and decreases complexity. It comes in a standard, Recon (which adds two side pouches), and corpsman versions. The ILBE load equipment provides an improved load bearing vest and the associated pouches to carry ammunition, grenades, radios, and other items. All-purpose Lightweight Individual Carrying Equipment (ALICE) mixed with some Individual Integrated Fighting System (IIFE) items remain in some limited use in training and non-deployable units. The standard canvas or nylon seabag, a militarized duffel bag, has been issued to servicemembers of all branches since before World War II. 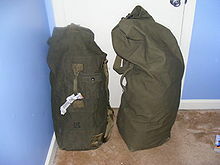 However, the increase in equipment issued to an individual Marine has made containing and transporting it all in a standard seabag difficult (a phenomenon nicknamed seabag drag), in addition to a tactical load-bearing pack. The Deployment Bag holds the same cubic footage, but rugged wheels allow it to roll much like a ruggedized version of commercial rolling luggage. The Gunslinger pack allows a Scout Sniper to conceal and protect his sniper rifle within the pack while on the move. All Purpose Environmental Clothing System (APECS): Rather than issue the 3rd generation Extended Cold Weather Clothing System (ECWCS), the Marine Corps has begun issuing the APECS, consisting of a MARPAT parka and pant. The APECS is structurally almost identical to ECWCS shell jacket and trousers. Polypropylene undershirt and underdrawer, nicknamed "polypro" and officially known as "silkweight", is a mock turtleneck and trousers designed to be worn next to skin, and designed by Polartec. Flame-resistant versions are available. Mountain/Cold Weather Boots, later renamed Rugged All Terrain (RAT) Boots, and Extreme Cold Vapor Barrier Boots are given. The overboots are insulated with an air barrier, and include a valve to allow paratroopers to jump with them, while the RAT Boot is reinforced with chemically impregnated leather for durability and stability. The Flame Resistant Organizational Gear (FROG) is a fire and heat protection system designed to help protect Marines from burn injuries associated with roadside bombs. Units with firefighting capabilities (Marine Wing Support Squadrons and Headquarters and Headquarters Squadrons ) are issued firefighting suits and self-contained breathing apparatus. Coveralls or jumpsuits are issued to vehicle crew, mechanics, and other Marines whose duties may render other uniforms unserviceable. They can have varying degrees of fire protection, and come in green and coyote brown to match the seasonal change of utilities from woodland to desert camouflage. Pilots and aircrew typically wear flight suits and flight jackets, as well as g-suit, pressure suits, and life vests as needed. The Marine Corps Combat Utility Uniform has built-in slots for knee and elbow pads, but many Marines prefer to purchase their own pads. The Commandant has authorized units to purchase knee and elbow pads for uniformity. The Corps is also contracting to receive protective silk underwear in use by the British Army. While not designed for ballistic protection, the so-called "blast boxers" do provide wound mitigation to groin injuries. The Individual First Aid Kit (IFAK) is used for immediate battlefield treatment. It includes several bandages, a tourniquet, burn ointment, some water purification tablets, and QuikClot Antihemorrhagic/hemostatic agent. The Army utilizes an IFAK with different contents, but a similar purpose. In 2010, the QuikClot powder was replaced by QuikClot Combat Gauze, a kaolin-infused gauze bandage. Individual Water Purification System allows Marines to purify water to potable standards. These can be compatible with the standard issue hydration pack, similar to CamelBak brand packs. Of course, plastic 1-quart canteens are issued as well, with a metal canteen cup and stand. Several types of eye protection are offered, including ballistic goggles and sunglasses made by Eye Safety Systems, Inc. and Wiley X, and are available with prescription lens inserts. The entrenching tool or "E-tool" is standard issue to all Marines to prepare defensive fighting positions. All Marines usually receive a foam sleeping mat, a Modular Sleep System (with a light, heavy, and waterproof sleeping bags to allow the user to adapt to ambient conditions and a compression sack to hold them), and a tarpaulin or waterproof poncho and liner that doubles as an expedient blanket. The Vietnam War-era olive drab plastic angle-head flashlight (running on D-cell batteries with colored lens filters) purchased at recruit training was deemed unsuitable for combat in 2007, and a replacement from Streamlight was fielded in 2009. The Sidewinder HandHeld FlashLight (HHFL) is lightweight with a head adjustable over 185° of movement, light-emitting diodes providing five intensities each of white, red, blue, and infrared light (including a strobe function), helmet mount, and runs on AA batteries. Aside from providing illumination, this smaller and lighter flashlight can be used for signalling and detecting blood residue. There is no standard tactical light. Many Marines choose to purchase their own. The Martial Arts Kit (MAK) allows units to train Marines in the Marine Corps Martial Arts Program. It contains all of the pads, gloves, props, and other safety aids that allow an instructor to successfully teach the program. The Mechanical Breacher's Kit (MBK) allows an assault breacher to breach a door or other obstacle. Various mountain-warfare items have been fielded, including snowshoes, skis, climbing kits, and Portable/camping stoves. Numerous parachutes are used, such as the static line T-10 and T-11, Military Free Fall Parachute System, and various aviation-specific models used for aircrew survival. Various types of haversacks were issued in World War I. ^ "Marine Corps Lightweight Helmet: Sling Suspension vs. Padded Suspension" (PDF). Marine Corps Systems Command. USMC. p. 2. Archived from the original (PDF) on 2009-03-04. Retrieved 2008-07-22. ^ Hoellwarth, John (March 2007). "Extended Protection" (PDF). Marine Corps Times. Army Times Publishing Company. Archived from the original (PDF) on 2009-03-04. Retrieved 2008-07-22. ^ Sanborn, James K. (June 2, 2010). "Marine Corps fielding new gas mask". Marine Corps Times. Archived from the original on 9 June 2010. Retrieved 2 June 2010. ^ a b "Solicitation Number M6785411R3019; USMC Pack". Marine Corps Systems Command. Federal Business Opportunities. April 8, 2011. Retrieved May 6, 2011. ^ Lamothe, Dan (December 8, 2010). "Corps looks to field 100,000 new packs". Marine Corps Times. Archived from the original on 2012-01-18. Retrieved May 6, 2011. ^ "Breaking News – USMC to Buy New Pack". Soldier Systems Daily. April 8, 2011. Retrieved May 6, 2011. ^ "RAT Boot" (PDF). Archived from the original (PDF) on 2011-08-12. Retrieved 2009-11-09. ^ Lamothe, Dan (April 12, 2011). "Marines to receive combat underwear". Marine Corps Times. Archived from the original on 2011-04-17. Retrieved April 14, 2011. ^ "Improved First-Aid Kit (IFAK)". ArmyProperty.com. Inventory Management Solutions, LLC. c. 2007. Retrieved 23 February 2010. ^ Cavallaro, Gina (June 14, 2010). "Standardized tourniquet, new bandages for IFAK". Marine Corps Times. Archived from the original on 2012-01-18. Retrieved 14 June 2010. ^ "Eyeing Some New Goggles" (PDF). Preventive Maintenance Monthly. US Army (614): 48–49. January 2004. Archived from the original (PDF) on 2009-03-04. Retrieved 2008-07-22. Wikimedia Commons has media related to Equipment of the United States Marine Corps.